PROGIRA® manager is your ultimate spectrum management system, which automates the everyday tasks of radio frequency administration and regulation. Take control of the processes in spectrum management to meet evolving regulatory, technological, operational, and customer requirements. One size does not fit all for spectrum management systems. Therefore, our systems are designed with a strong foundation that enable customizations, so that when ‘you order, we build’. We avoid reinventing the wheel, and aim to integrate all existing systems on a single platform. Therefore we are able to offer you integrated solutions with minimal downtime and costs. Further, PROGIRA manager is tailored for your requirements, and designed to ensure future growth while simplifying your journey to successful spectrum management at the same time. Our cartographic solutions are based on global leading GIS system – Esri’s ArcGIS. ArcGIS softwares will be used for the storage, processing and display of geographic data and terrain/topography data. It supports multiple coordinate systems and enables asynchronous operation. 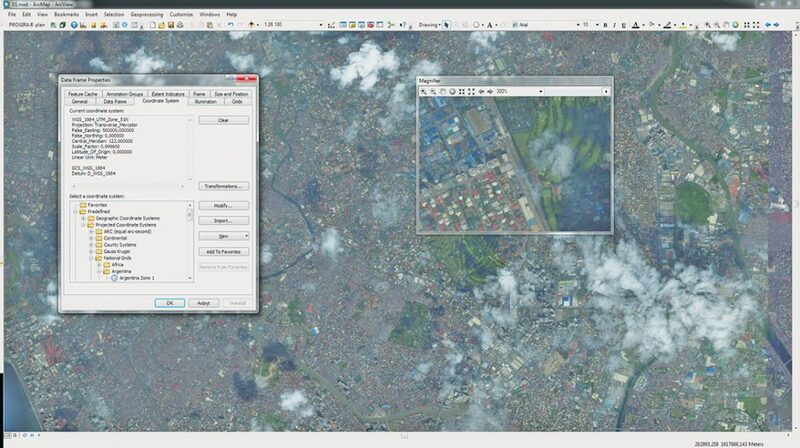 ArcGIS Desktop is a suite of integrated applications, including ArcMap, ArcCatalog, ArcGlobe, ArcScene, and ArcToolbox. PROGIRA® manager uses ArcGIS Runtime to expose users to the full capabilities of the ArcGIS platform on multiple devices. It enables the display and animation of large numbers of map features while maintaining the smooth feel of a native application. Furthermore, users benefit from advanced cartography, such as beautiful, detailed and geodetically accurate symbology, including military symbols, and symbols that rotate. ArcGIS is an open and widely used GIS platform that makes geographical presentations more user-friendly and eases the addition of new presentation formats and GIS applications. We can offer high quality topographical and terrain mapping data from the world leading map suppliers at a competitive rate. The engineering analysis functions within PROGIRA® manager accelerates your spectrum planning for your broadcasting, mobile, fixed, and satellite services, as well as for radio amateurs. We ensure you coordinate and optimize your use of frequencies with maximum efficiency, while complying with international regulations and bilateral agreements. Automates each and every step of your entire spectrum management process. The spectrum management system supports the full automation of processes during the entire spectrum management lifecycle, from application. frequency planning, allotment, allocation, frequency assignment, authorization of licenses to monitoring. Comprehensive automation of multiple, parallel, overlapping processes helps saves time, resources and reduce costly errors. Automatic tracking: monitors every user actions, automatically logs data changes, station versions, licensing actions etc. We offer maintenance contracts for all our products, including PROGIRA® manager – PROGIRA® maintenance. Maintenance contracts provides technical support, software updates and a help desk. If you have questions or any trouble with PROGIRA® manager contact us directly at support@progira.com. PROGIRA® manager is a specialized software system that offers complete automation of everyday tasks, such as administrative, technical and financial, associated with the crucial process of spectrum management. 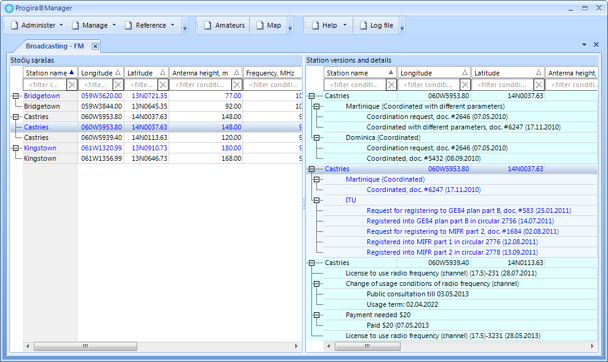 It also provides tools for spectrum planning and interfaces with PROGIRA® plan. Take operational efficiency and grow your revenues, by integrating all processes and tools on to one platform – PROGIRA® manager. PROGIRA® plan is our network planning and spectrum engineering software, for more demanding and detailed network planning projects. Furthermore, it has capabilities to interface seamlessly with existing databases, accounting systems, spectrum monitoring systems, therefore accelerating the integration process. PROGIRA® manager is designed by regulators for regulators. We know how challenging it can be to manage the spectrum. It involves multiple workflows, roles, stakeholders, tools, regulations and thus moving pieces. Yet, spectrum management is such an important job, because if you take charge of a limited resource like spectrum in the right way, you can assure your secure and reliable management with minimal resources. Consolidate all these moving pieces together with Advanced Automation, Easy Customization and Ultimate Security, on one single platform – PROGIRA® manager. Get ready! Manage your spectrum confidently and strengthen your business. 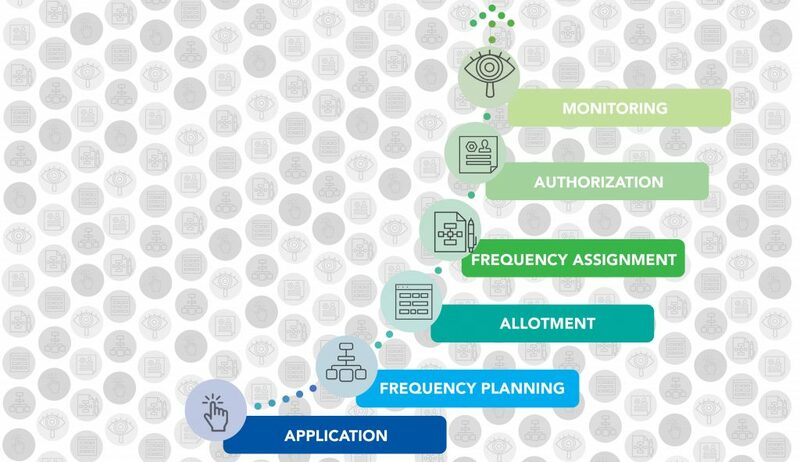 Automates seamlessly every integral stage of your spectrum’s lifecycle – application, planning, assignment, allotment, licensing, enforcement and tracking. The intuitive workflow editor allows tailoring the multiple processes, within a spectrum lifecycle, based on your specific organizational needs. With advanced automation, you can improve each stage of your spectrum’s lifecycle with compliance. As a result, you can focus on important parts of the business and achieve your goals. Take spectrum management to a whole new level of operational efficiency. PROGIRA® manager is exceptionally flexible to tailor to specific national linguistic, technical and legal environment, and thus your specific needs. 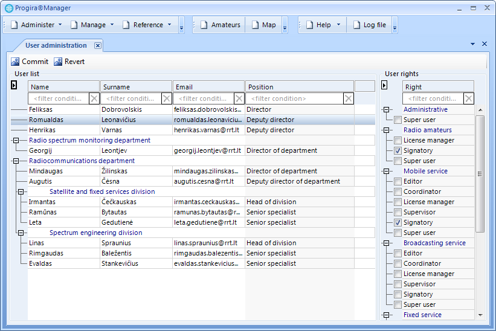 The operating system of PROGIRA® manager provides a robust and stable basis for careful customizations. We build to integrate all existing systems. So, there is no reinventing the wheel! The outcome? We ensure swift installations and adaptations of our system! Security is of utmost importance as we transform your spectrum management to ensure maximal operational and cost efficiency. We maintain optimal security to protect your investments with the triple ‘A’, Access Control, Automatic Tracking and Active Authentication. We want you to gain control, and manage confidently!